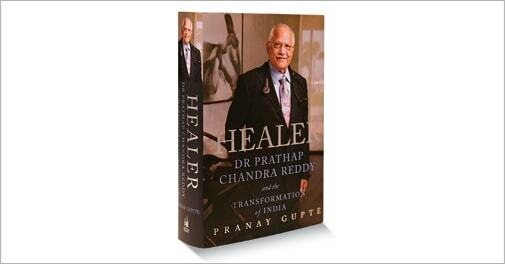 This voluminous book captures the life and times of doctor-turned-entrepreneur Prathap C. Reddy, Founder Chairman, Apollo Hospitals. and indeed the originator of high-class corporate health care in this country. With Apollo having become a byword for high-class, high-cost health care, biographer Pranay Gupte followed Reddy around India for a whole year to write the book. It looks mostly at Reddys early life, leading up to a historic date, September 18, 1983, when Apollos first hospital in Chennai, was inaugurated by Giani Zail Singh, the then Indian president. Gupte maintains that when Reddy returned to India from the US in 1970, setting up Apollo Hospitals may not have been among his objectives. His first goal then was to create a first-rate cardiology practice. There are stories too surrounding the setting up of the hospitals. How did Reddy acquire the land for his first hospital? He bid for it. An auction of the plot on Greams Road in central Chennai was held on October 10, 1979 at Chennais Cochin House. Reddy consulted his astrologer and numerologist D. Nagarajan, who made some calculations and suggested Reddy put up a figure of Rs 17.4 lakh, which turned out to be the winning bid. The book also touches upon Reddys uncanny ability to persuade people. To bureaucrats in socialist India, for instance, notoriously wary of the private sector, especially in a sector such as health care, he would point to the sore need for more hospital beds, and the fact that while the government may provide basic primary health care, it simply did not have the wherewithal or manpower to offer tertiary care. To intellectuals and other influencers of public policy, Reddy would point out that by 2030, India would have 500 million retirees of a projected population of 1.6 billion. Who would provide them with appropriate health-care facilities if he did not take the initiative? Reddys widespread influence can be gauged from one section of the book which carries testimonials about him from all kinds of movers and shakers - they include Jeffrey Immelt, Chairman and CEO, General Electric; Ratan Tata, Chairman, Tata Trusts; and Mukesh Ambani, Chairman and CEO, Reliance Industries. Reddy seems to have also found admirers among spiritual gurus such as Sadhguru Jaggi Vasudev, Founder, Isha Foundation, and among politicians such as Kamal Nath, Union Minister for Parliamentary Affairs and Urban Development. Apart from recording the growth of the Apollo chain from a single hospital to over 50 today, employing close to 70,000 people, the book also dwells on Reddys personal life. With Andhra Pradesh in the throes of being carved up into Telangana and Andhra regions, it is interesting that the book describes him as "an Andhra Reddy". He is a Rayalaseema Reddy from the Chittoor region, while his wife Sucharitha comes from Khammam, which is would be part of the Telangana region. The book portrays Reddy as a man who is always thinking ahead and planning for the future. After turning 80 in February 2013, he set up a family council to oversee both transition and third-generation involvement in Apollo Hospitals. It seems that Reddys father has been proven right. It was he who wrote to the young Reddy urging him to return to India after finishing his training in the US when Reddy was toying with the idea of settling down in that country.